Jack will require all his skills just to stay alive as a Special Forces Cadet...A top-secret government programme needs a crack team of undercover military operators. Which is what happens when Jack Silver, Lukas Channing, Abby Asher and Sami Hakim are sent into an armed siege in... read full description below. 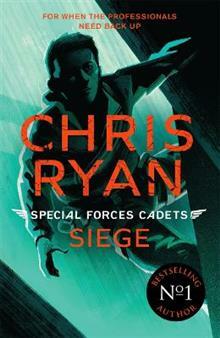 From the bestselling author of STRIKE BACK, Chris Ryan returns with a new action-packed series.Tough enough? Smart enough? Jack will require all his skills just to stay alive as a Special Forces Cadet...A top-secret government programme needs a crack team of undercover military operators. They must have awesome levels of determination, endurance and fitness. They must be able to think on their feet. The recruits undergo the most rigorous and testing selection process the modern military can devise. And in order to operate in circumstances where adult forces would be compromised, the recruits must be under sixteen. Only a few are tough enough and smart enough to make it . . . And once out in the field, they will require all their skills just to stay alive. Which is what happens when Jack Silver, Lukas Channing, Abby Asher and Sami Hakim are sent into an armed siege in an inner-city school . . .
Chris Ryan was born in 1961 in a village near Newcastle. In 1984 he joined the SAS. During his ten years in the Regiment, he was involved in overt and covert operations and was also Sniper team commander of the anti-terrorist team. During the Gulf War, Chris was the only member of an eight-man team to escape from Iraq, of which three colleagues were killed and four captured. It was the longest escape and evasion in the history of the SAS. For this he was awarded the Military Medal. During Ryan's last two years in the Regiment he selected and trained potential SAS recruits. He left the SAS in 1994. His work in security takes him around the world. He has also appeared in a number of TV programmes,including HUNTING CHRIS RYAN, PUSHED TO THE LIMIT (Toughest Families) and TERROR ALERT (Sky TV, 2004).